Next Monday, Americans will be staying home from work in celebration of Labor Day. 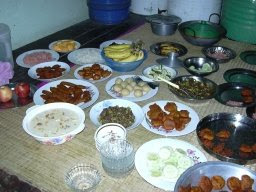 In Bangladesh, next Monday will also be a very special day, though for different reasons - it will be the beginning of Ramadan 2008. Around 90% of the population of Bangladesh are Muslim. So, much like Christmas has become a quasi public holiday season in the US, Islamic holidays have a significant imprint on public life in Bangladesh. At sundown, or "iftar," the fast is broken. Often, the fast will be broken initially with dates and sharbat, a rose water-like drink. Iftar is a time when people come together to share food and conversation, resulting in grand meals of savory snacks. 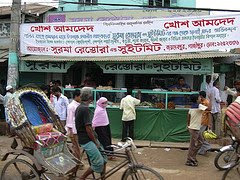 And throughout Bangladesh, roadsides will be filled with iftar stands selling a variety of delicious foods. But Ramadan is not all about food (or the lack thereof), it's also a time when Muslims reach out to the poor in their communities by paying "zakat," or alms. Islam requires adherents to give 2.5% of their wealth to the poor every year. Often during Ramadan this charity is distributed.